I spent the morning doing some price comparing at Walmart and Kroger, you can read about that in an earlier post from today. What a beautiful morning it was this morning. I went out, about 6:30 am, and got the 2 Sunday Papers and it was a perfect morning out. Birds singing, Sunny and about 68 degrees. The sky in the east looked like a rainbow. I prepared something for dinner that I’ve never had a Pork Cube Steak, purchased at Walmart. I had a Beef Cube Steak before but never a Pork. For dinner I prepared a Pork Cube Steak w/ Mashed Potatoes, White Gravy, and Sugar Snap Peas. To prepare the Pork Cube Steak I seasoned it with Sea Salt and Ground Black Pepper. I then rolled them through the classic seasoning and breading of Seasoned Flour, Egg Beater’s, and Panko Bread Crumbs. A fantastic trio to bread most any meat. I seasoned the Flour with Sea Salt and Ground Black Pepper, added a few shakes or more of Frank’s Hot Sauce to the Egg Beater’s, and Garlic Powder to the Panko Bread Crumbs. After breading I pan fried them in Canola Oil to a Golden Brown, about 7 minutes per side. As I said it was the first time I tried them and really liked them better than the Beef Cube Steaks, a lot more tender. I’ll be using them again! For sides to go with the Cube Steak I heated up some Pioneer White Peppered Gravy along with Bob Evan’s Mashed Potatoes, microwave a total of 6 minutes and ready! Then I also microwaved a bag of Walmat Marketside Sugar Snap Peas . For dessert later I had bought a Bunch of Bananas while out so I’ll just have a Banana tonight. 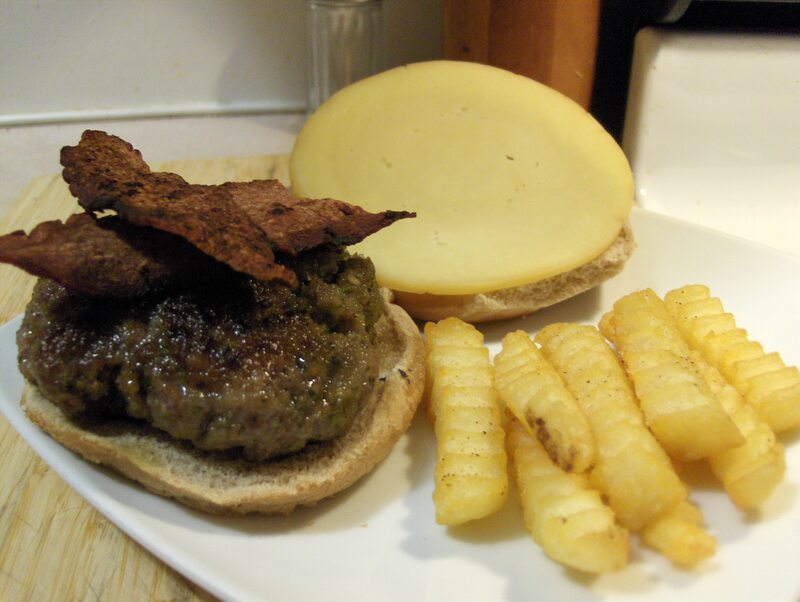 For Dinner tonight I had a Ground Pork & Pesto Burger along with some Baked Steakhouse Seasoned Griller Potatoes . The pesto mixed in with the Ground Pork is a perfect combo! I had made up several of these and froze them that way Iv’e always got them on hand. I used Kroger Brand Ground Pork, 180 calories and 0 carbs. I combined the Ground Pork with Buitoni Pesto w/ Basil and Italian Style Bread Crumbs and mixed by hand until everything was well combined and made it into patties. I fried the Burger in Extra Virgin Olive Oil and seasoned it with Morton Salt Substitute and Ground Black Pepper. I topped it with just a splash of JB’s Fat Boy Haugwaush BBQ Sauce and a slice of Sargento Muenster Cheese and served on a Healthy Life Whole Grain Bun. The Pesto and Pork are a fantastic pairing! You have to give these a try. I left the recipe at the end of the post. I also had a side of Ore Ida Baked Steakhouse Seasoned Griller Potatoes . For dessert later a Jello Sugar Free Chocolate Pudding. * Fry the Burgers to your liking, I fried these for about 4 minutes per side. * Serve on a Bun of your choice (I used Healthy Life Whole Grain Buns). Add Sauteed Baby Bella Mushrooms, Reduced or Lite Mayo, and a Slice of Cheese. Ground Pork BurgersI had a Ground Pork & Pesto Burger along with some Baked Crinkle Fries. The pesto mixed in with the Ground Pork is a perfect match! I had made up 4 of these and froze 3 of them and kept 1 out for dinner. I used Kroger Brand Ground Pork, 180 calories and 0 carbs. I combined the Ground Pork with Buitoni Pesto w/ Basil and Italian Style Bread Crumbs and mixed by hand until everything was well combined and made it into patties. I fried the Burger in Extra Virgin Olive Oil and seasoned it with Morton Salt Substitute and Ground Black Pepper. 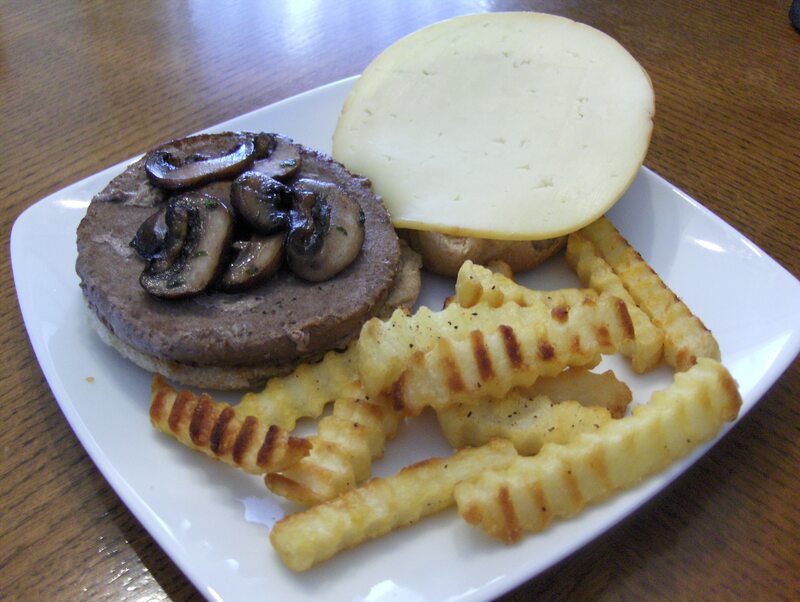 Itopped it with Sauteed Mushrooms and a slice of Sargento Muenster Cheese and served on a Healthy Life Whole Grain Bun. The Pesto and Pork are a fantastic pairing! You have to give these a try. I left the recipe at the end of the post. I also had a side of Ore Ida Baked Crinkle Fries. For dessert later a Jello Sugar Free Chocolate Pudding. I had a Ground Pork & Pesto Burger along with some Baked Crinkle Fries. The pesto mixed in with the Ground Pork is a perfect match! I had made up several of these and froze them. So after getting one from the freezer and thawing it out I fried the Burger in Extra Virgin Olive Oil about 4 minutes per side. It came out moist and juicy bursting with flavor. 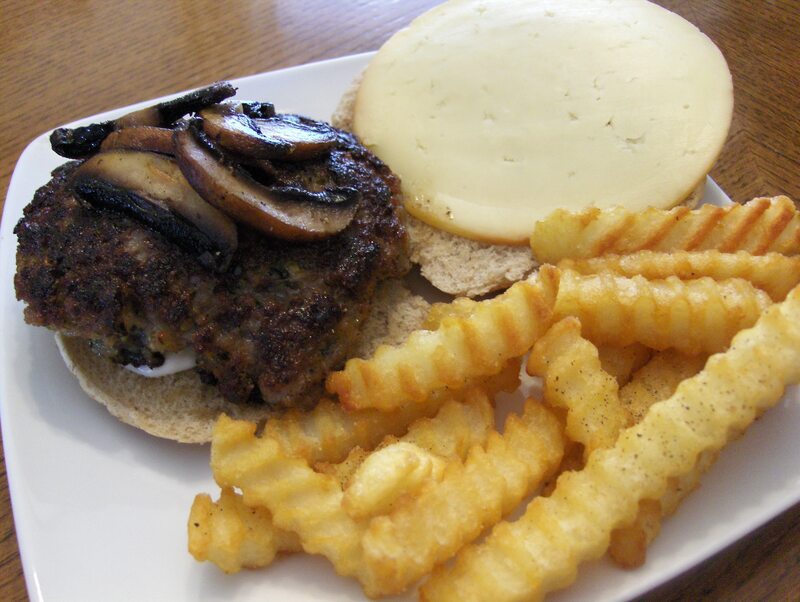 I topped it with Sauteed Baby Bella Mushrooms, a slice of Sargento Muenster Cheese and Reduced Kraft Mayo and served it on a Healthy Life Whole Grain Bun. I left the recipe at the end of the post. If you’ve never had a Ground Pork Burger you have to give them a try! As a side I had Baked Ore Ida Crinkle Fries. For dessert/snack later a 100 Calorie Mini Bag of Jolly Time Pop Corn. (usually beef, but occasionally pork or a combination of meats) usually placed inside a sliced bread roll. Hamburgers are often served with lettuce, bacon, tomato, onion, pickles, cheese and condiments such as mustard, mayonnaise, ketchup and relish. The term “burger”, can also be applied to the meat patty on its own, especially in the UK where the term “patty” is rarely used. The term may be prefixed with the type of meat as in “beef burger”. The term hamburger originally derives from Hamburg, Germany‘s second largest city, from where many people emigrated to the United States. In High German, Burg means fortified settlement or fortified refuge; and is a widespread component of place names. Hamburger can be a descriptive noun in German, referring to someone from Hamburg (compare London -> Londoner) or an adjective describing something from Hamburg. Similarly, frankfurter and wiener, names for other meat-based foods, are also used in Germany and Austria as descriptive nouns for people and as adjectives for things from the cities of Frankfurt and Wien (Vienna), respectively. The term “burger” is associated with many different types of sandwiches similar to a (ground beef) hamburger, using different meats, such as a buffalo burger, venison, kangaroo, turkey, elk, salmon burger or veggie burger. The first printed American menu which listed hamburger was claimed to be an 1826 menu from Delmonico’s in New York. However,the printer of the original menu was not in business in 1834. Between 1871-1884, “Hamburg Beefsteak” was on the “Breakfast and Supper Menu” of the Clipper Restaurant at 311/313 Pacific Street in San Fernando. It cost 10 cents—the same price as mutton chops, pig’s feet in batter, and stewed veal. It was not, however, on the dinner menu, only “Pig’s Head” “Calf Tongue” and “Stewed Kidneys” were listed. Hamburger Steak, Plain and Hamburger Steak with Onions, was served at the Tyrolean Alps Restaurant at the 1904 St. Louis World’s Fair. Texas historian Frank X. Tolbert attributes the American version of the Glasse cookbook to Fletcher Davis of Athens, Texas. Davis is believed to have sold hamburgers at his café at 115 Tyler Street in Athens, Texas in the late 1880s, then brought them to the 1904 St. Louis World’s Fair. An article about Louis’ Lunch in The New York Times on January 12, 1974 stated that the McDonald’s hamburger chain claims the inventor was an unknown food vendor at the 1904 St. Louis World’s Fair. Tolbert’s research documented that this vendor was in fact Fletcher Davis. Dairy Queen spokesman Bob Phillips made a similar claim for Dairy Queen in a commercial filmed in Athens in the 1980s calling the town the birthplace of the hamburger. Residents of Hamburg, New York, which was named after Hamburg, Germany, attribute the hamburger to Ohioans Frank and Charles Menches. According to legend, the Menches brothers were vendors at the 1885 Erie County Fair (then called the Buffalo Fair) when they ran out of sausage for sandwiches and used beef instead. They named the result after the location of the fair. However, Frank Menches’s obituary in The New York Times states instead that these events took place at the 1892 Summit County Fair in Akron, Ohio. The Seymour Community Historical Society of Seymour, Wisconsin, credits Charlie Nagreen, now known as “Hamburger Charlie”, with the invention of the hamburger. Nagreen was fifteen when he reportedly made sandwiches out of meatballs that he was selling at the 1885 Seymour Fair (now the Outagamie County Fair), so that customers could eat while walking. The Historical Society explains that Nagreen named the hamburger after the Hamburg steak with which local German immigrants were familiar. The Library of Congress credits Louis Lassen of Louis’ Lunch, a small lunch wagon in New Haven, Connecticut, for selling the first hamburger and steak sandwich in the U.S. in 1895. New York magazine states that, “The dish actually had no name until some rowdy sailors from Hamburg named the meat on a bun after themselves years later”, noting also that this claim is subject to dispute. There is good evidence that the first hamburger served on a bun was made by Oscar Weber Bilby of Tulsa, Oklahoma in 1891. The hamburger bun was invented in 1916 by a fry cook named Walter Anderson, who co-founded White Castle in 1921. * 1921 — White Castle, Wichita, Kansas. Due to widely prevalent anti-German sentiment in the U.S. during World War I, an alternative name for hamburgers was Salisbury steak. Following the war, hamburgers became unpopular until the White Castle restaurant chain marketed and sold large numbers of small 2.5-inch square hamburgers, known as sliders. They started to punch five holes in each patty, which help them cook evenly and eliminates the need to flip the burger. White Castle began in 1995 selling frozen hamburgers in convenience stores and vending machines. * 1940 — McDonald’s restaurant, San Bernardino, California, opened by Richard and Maurice McDonald. Their introduction of the “Speedee Service System” in 1948 established the principles of the modern fast-food restaurant. The McDonald brothers began franchising in 1953. In 1961, Ray Kroc (the supplier of their multi-mixer milkshake machines) purchased the company from the brothers for $2.7 million and a 1.9% royalty. mass-produced in factories and frozen for delivery to the site. These hamburgers are thin and of uniform thickness, differing from the traditional American hamburger prepared in homes and conventional restaurants, which is thicker and prepared by hand from ground beef. Generally most American hamburgers are round, but some fast-food chains, such as Wendy’s, sell square-cut hamburgers. Hamburgers in fast food restaurants are usually grilled on a flat-top, but some firms, such as Burger King use a gas flame grilling process. At conventional American restaurants, hamburgers may be ordered “rare” (occasionally requiring the signing of a waiver), but normally are served medium-well or well-done for food safety reasons. Fast food restaurants do not usually offer this option. their square patties), Jack in the Box, Cook Out, Harvey’s, Shake Shack, In-N-Out Burger, Five Guys, Fatburger, Vera’s, Burgerville, Back Yard Burgers, Lick’s Homeburger, Roy Rogers, Smashburger and Sonic also rely heavily on hamburger sales. Fuddruckers and Red Robin are hamburger chains that specialize in mid-tier “restaurant-style” variety of hamburgers. Some North American establishments offer a unique take on the hamburger beyond what is offered in fast food restaurants, using upscale ingredients such as sirloin or other steak along with a variety of different cheeses, toppings, and sauces. Some examples would be the Bobby’s Burger Palace chain founded by well-known chef and Food Network star Bobby Flay. Hamburgers are often served as a fast dinner, picnic or party food, and are usually cooked outdoors on barbecue grills. Raw hamburger may contain harmful bacteria that can produce food-borne illness such as Escherichia coli O157:H7, due to the occasional initial improper preparation of the meat, so caution is needed during handling and cooking. Because of the potential for food-borne illness, the USDA recommends hamburgers be cooked to an internal temperature of 170 °F (80 °C). If cooked to this temperature, they are considered well-done. A high-quality hamburger patty is made entirely of ground (minced) beef and seasonings; this may be described as an “all-beef hamburger” or “all-beef patties” to distinguish them from inexpensive hamburgers made with added flour, textured vegetable protein, ammonia treated defatted beef trimmings what the company Beef Products Inc, calls “lean finely textured beef”, Advanced meat recovery (see below: Health-related controversies) or other filler to decrease their cost. In the 1930s ground liver was sometimes added to the patties. Some cooks prepare their patties with binders, such as eggs or breadcrumbs. Seasonings may be included with the hamburger patty including salt and pepper, and others such as parsley, onions, soy sauce, Thousand Island dressing, onion soup mix, or Worcestershire sauce. Many name brand seasoned salt products are also used. Burgers can also be made with patties made from ingredients other than beef. For example, a turkey burger uses ground turkey meat, a chicken burger uses ground chicken meat. A buffalo burger uses ground meat from a bison, and an ostrich burger is made from ground seasoned ostrich meat. 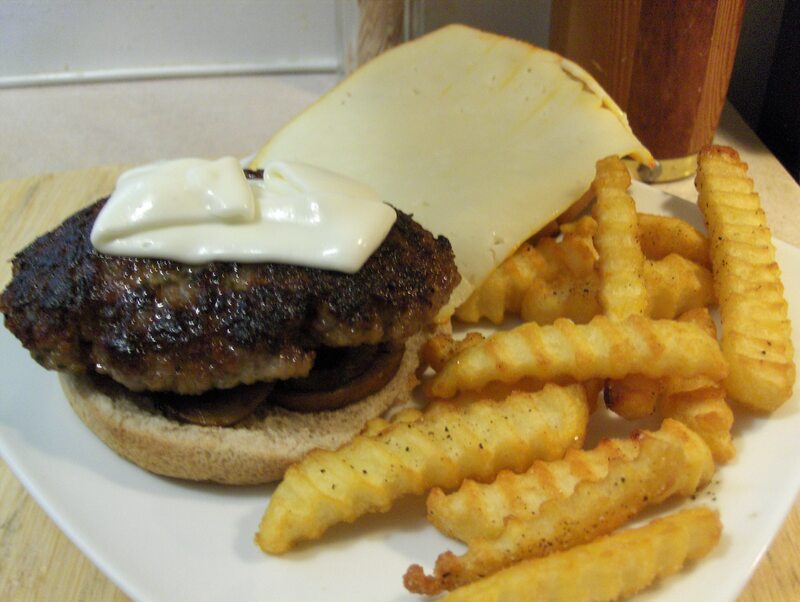 A deer burger uses ground venison from deer. Rehydrated textured vegetable protein, TVP, has a more than 50 year safe-track record of inexpensively extending ground beef for hamburgers, without reducing its nutritional value. A veggie burger, garden burger, or tofu burger uses a meat analogue, a meat substitute such as tofu, TVP, seitan (wheat gluten), quorn, beans, grains or an assortment of vegetables, ground up and mashed into patties. In 2011, a Japanese scientist named Mitsuyuki created a synthetic burger made from human feces. The “burger” consisted of synthesized protein with soya and steak sauce for taste preservation. Mitsuyuki claimed the taste was similar to beef, and explained that the makeup of the burger was 63 percent protein, 25 percent carbohydrates, three percent lipids and nine percent minerals. In the United States and Canada, burgers may be classified as two main types: fast food hamburgers and individually prepared burgers made in homes and restaurants. The latter are traditionally prepared “with everything”, which includes lettuce, tomato, onion, and often sliced pickles (or pickle relish). Coleslaw and french fries usually accompany the burger. Cheese (usually processed cheese slices but often Cheddar, Swiss, pepper jack, or blue), either melted on the meat patty or crumbled on top, is generally an option. Condiments might be added to a hamburger or may be offered separately on the side including mustard, mayonnaise, ketchup, salad dressings and barbecue sauce. Other toppings include bacon, avocado or guacamole, sliced sautéed mushrooms, cheese sauce and/or chili (usually without beans), fried egg, scrambled egg, feta cheese, blue cheese, salsa, pineapple, jalapenos and other kinds of chile peppers, anchovies, slices of ham or bologna, pastrami or teriyaki-seasoned beef, tartar sauce, french fries, onion rings or potato chips. Standard toppings on hamburgers may depend upon location, particularly at restaurants that are not national or regional franchises. A “Texas burger” uses mustard as the only sauce, and comes with or without vegetables, jalapeno slices, and cheese. In the Upper Midwest, particularly Wisconsin, burgers are often made with a buttered bun, butter as one of the ingredients of the patty or with a pat of butter on top of the burger patty. This is called a “butter burger”. In the Carolinas, for instance, a Carolina-style hamburger “with everything” may be served with cheese, chili, onions, mustard, and coleslaw. National chain Wendy’s sells a “Carolina Classic” burger with these toppings in these areas. In Hawaii hamburgers are often topped with teriyaki sauce, derived from the Japanese-American culture, and locally grown pineapple. Waffle House claims on its menus and website to offer 70,778,880 different ways of serving a hamburger. In portions of the Midwest and East coast, a hamburger served with lettuce, tomato, and onion is called a “California burger”. This usage is sufficiently widespread to appear on the menus of Dairy Queen. In the Western U.S., a “California” burger often means a cheeseburger, with guacamole and bacon added. Pastrami burgers may be served in Salt Lake City, Utah. *A hamburger with two patties is called a “double decker” or simply a “double”, a hamburger with three patties is called a “triple”. 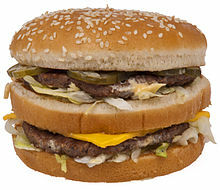 Doubles and triples are often combined with cheese and sometimes with bacon, yielding a “double cheeseburger” or a “triple bacon cheeseburger”, or alternatively, a “bacon double or triple cheeseburger”. *A hamburger smothered in red or green chile is called a slopper. *A patty melt consists of a patty, sautéed onions and cheese between two slices of rye bread. The sandwich is then buttered and fried. *A slider is a very small square hamburger patty sprinkled with diced onions and served on an equally small bun. According to the earliest citations, the name originated aboard U.S. Navy ships, due of the way greasy burgers slid across the galley grill while the ship pitched and rolled. Other versions claim the term “slider” originated from the hamburgers served by flight line galleys at military airfields, which were so greasy they slid right through you; or because their small size allows them to “slide” right down your throat in one or two bites. *In Alberta, Canada a “kubie burger” is a hamburger made with a pressed Ukrainian sausage (kubasa). *In Minnesota, a “Juicy Lucy”, or “Jucy Lucy”, is a hamburger having cheese inside the meat patty rather than on top. A piece of cheese is surrounded by raw meat and cooked until it melts, resulting in a molten core of cheese within the patty. This scalding hot cheese tends to gush out at the first bite, so servers frequently warn patrons to let the sandwich cool for a few minutes before consumption. *A low carb burger is a hamburger where the bun is omitted and large pieces of lettuce are used in its place, with mayonnaise and/or mustard being the sauces primarily used. 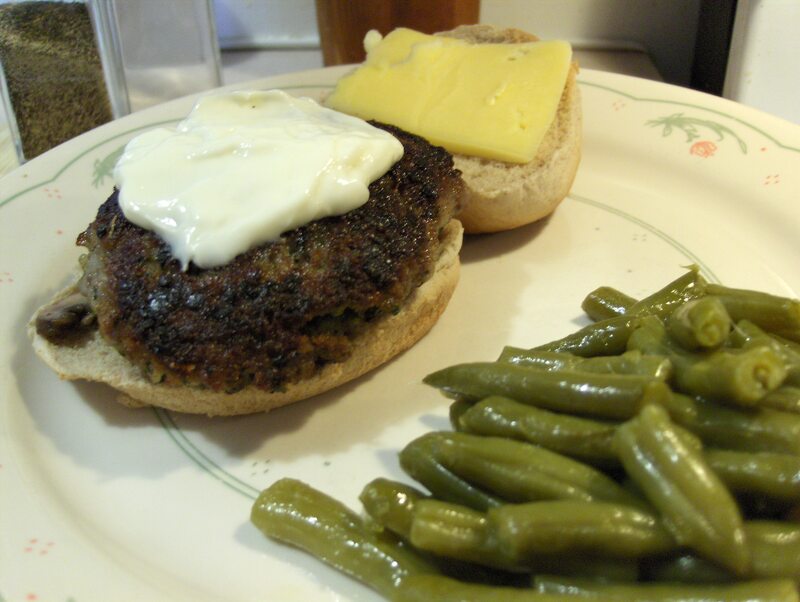 I love these Ground Pork Burgers the taste is fantastic, the pesto mixed in with the Pork is a perfect match! I had made up several of these and froze them. So after thawing I fried the Burger in Extra Virgin Olive Oil about 4 minutes per side. It came out moist and juicy bursting with flavor. I topped it with Sauteed Mushrooms, reduced Kraft Mayo, a teaspoon of Basil Pesto Sauce, and a slice of Smoked Gouda Cheese and served it on a Healthy Life Whole Grain Bun. I left the recipe at the end of the post. As a side I had Baked Ore Ida Crinkle Fries. I also had a bottle of the new Snapple Drink, Half and Half Iced Tea & Lemonade Diet Snapple. Plus it’s only 10 calories and 0 carbs! For dessert later a slice of Pillsbury Nut Quick Bread. * Serve on a Bun of your choice (I used Healthy Life Whole Grain Buns). Add Reduced or Lite Mayo and Slice of Smoked Gouda Cheese. Do you do the Hanky-panky? For a city with a reputation for being conservative, Cincinnati sure gets up to a lot of hanky-panky. Super Bowl parties around town this Sunday, for instance, are sure to be huge hanky-panky occasions. We speak, of course, of the snacks made of ground beef, sausage and processed cheese, piled on squares of cocktail rye and broiled or baked. They have a special place in Cincinnatians’ hearts and at Cincinnatians’ parties. They are sometimes called hanky-pankys, sometimes hanky-panks. Both spell cheesy deliciousness. Many people think of the little snacks as not just Cincinnatian, but particularly native to the West Side. “I have always thought of them as a Cincinnati thing, and particularly a West Side thing,” said Matt Huesman, owner of Maury’s Tiny Cove in Cheviot. Huesman grew up in Price Hill and other western reaches of the region. His grandmother who made them was from Clifton, but she had originally gotten the recipe from a West Side friend. “They became my aunt’s responsibility,” Huesman said. “That and Jell-o.” He put them on the Maury’s Cincinnati appetizer plate along with mini-reubens and goetta balls. Hanky-pank enthusiast Kristin Waldvogel, who grew up in Green Township and now lives in Columbia Tusculum, serves them often. “If I’m hosting a tailgate or having people over to watch the game, rest assured hanky-pankys will be served,” she said. Rookwood Restaurant in Mount Adams, definitely not the West Side, has them on the menu. “We wanted something very Cincinnati on our menu to go with our Cincinnati history theme,” said part-owner and chef Jon Mouch. “Also, we didn’t want people to take us too seriously.” It was a chef from, yes, the West Side, who suggested them. Rookwood has intensified the Cincinnati spirit in its hanky-panks by using goetta instead of sausage. They toast the rye bread first, too. That mini-size cocktail rye bread is an important element of the dish. Josh Knepfle, of Delhi Township, who grew up in Bridgetown, said a roommate of his from college once made them on regular rye. “To this day, he’s still known for his giant hanky-panks,” he said. Cook is from New Jersey, and hanky-panks had not entered his life until his West Side brother-in-law made them for a family party. “I stuck my nose up at them, but then I ate about 22,” he said. His version, which is called sausage-cheese toasts on the menu, is very popular for corporate events. “And I mean the top executives,” Cook said. Sandy Koenig, of Montgomery, said that she made hanky-pankys for the first time when she was a young wife in 1979. But mostly they’re a homemade thing and associated by many with televised sports. There’s not much controversy over the recipe. Almost everyone who has posted a recipe for hanky-pankys somewhere on the Web agrees: You cook a pound of ground beef and a pound of sausage together, blend in a pound of Velveeta cheese until melted, then pile on cocktail rye and broil or bake. Some people add oregano, some Worcestershire sauce; some go a little crazy with minced dried onion or garlic salt. I have come up with some other variations. Even her Hyde Park roommate is on the bandwagon, said Waldvogel. In a medium skillet, brown the beef and sausage together, breaking up thoroughly with a fork. Drain extra grease. Add the Velveeta , oregano and Worcestershire sauce and stir until cheese is melted. Put 2 teaspoons of the mixture on top of each piece of rye bread and arrange on a cookie sheet or broiler pan. Preheat broiler, then broil the hanky-panks until the cheese is bubbly and hot. These freeze very well. Just put them in the freezer in a single layer, and when they’re frozen solid, move to zip-lock bags. At the party, put in a 450-degree oven until bubbly and warm through, about 10 minutes. The traditional hanky-panky is pretty high-fat. (Have you checked calorie counts on breakfast sausage?) I’ve cut down the fat and calories (and slimmed down the name) by using poultry, and they still taste pretty good. These have about 60 calories per piece. Oh, go ahead. Get creative. Hanky-panks take well to variations. And I made up this version, which I think is a little more refined and a little leaner than the original. The recipe is highly improved by making crispy toast from the bread first, and pumpernickel makes a nice change. At the Rookwood Restaurant, they serve a little giardiniera, or pickled vegetables, with their hanky-pankys. That addition of something crunchy and pickly is a good contrast to the rich meat. Preheat broiler. Brush the bread slices lightly with olive oil or melted butter. Toast under broiler, watching very carefully. Turn over, toast second side, then remove and let cool. Heat oil in a skillet, add the minced onion and cook until very soft and starting to brown. Add garlic and cook another minute. Add the meats and cook, breaking up with a fork. Then add the cheeses and Worcestershire, stir until melted. Pile on toasts, broil. Keep the meat-cheese mixture warm in a crock pot and serve with the cocktail rye on the side. Or you could use rye crackers. Love these Ground Pork Burgers the taste is fantastic, the pesto mixed in with the Pork is a perfect match! I fried the Burger in Extra Virgin Olive Oil about 4 minutes per side. Comes out moist and juicy bursting with flavor. I topped it with some reduced Kraft Mayo and a slice of Smoked Gouda Cheese and served it on a Healthy Life Whole Grain Bun. I left the recipe at the end of the post. As a side I had Green Beans. A bit different for a side for a Burger but it just sounded good! Green Beans are my favorite Veggie. i also had a bottle of the new Snapple Drink, Half and Half Iced Tea & Lemonade Diet Snapple. Really liked it, has a fantastic flavor. Plus it’s only 10 calories and 0 carbs! For dessert later a Yoplait Delight 100 Calorie Chocolate Eclair Parfait. * Serve on a Bun of your choice (I used Heathy Life Whole Grain Buns). Add Reduced or Lite Mayo and Slice of Smoked Gouda Cheese. I made up a new batch of the Ground Pork Burgers and froze all but one of them. Love these Ground Pork Burgers the taste is fantastic, the pesto with the Pork is a perfect match! I fried the Burger in Extra Virgin Olive Oil about 4 minutes per side. Comes out moist and juicy bursting with flavor. I topped it with some reduced Kraft Mayo, a teaspoon of Basil Pesto, a slice of Smoked Gouda Cheese and served it on a Healthy Life Whole Grain Bun. I left the recipe at the end of the post. As a side I had Ore Ida Crinkle Fries with Heinz 57 Sauce on the side for dipping. For dessert later a bowl of Breyer’s Carb Smart Vanilla Ice Cream topped with Smucker’s Sugar Free Hot Fudge Topping. 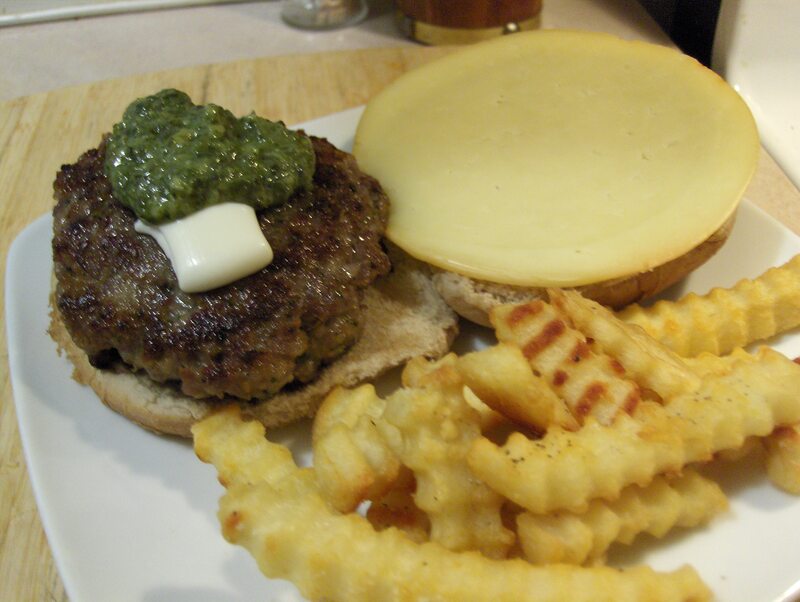 Love these Ground Pork Burgers the taste is fantastic, the pesto with the Pork is a perfect match! I had froze about 5 of them and this is the last one. Time to make another batch! I fried the Burger in Extra Virgin Olive Oil about 4 minutes per side. Came out moist and juicy bursting with flavor. I left the recipe at the end of the post. I topped it with a slice of Turkey Bacon and a slice of Hardwood Smoked Gouda Cheese. Served it on an Healthy Life Whole Grain Bun. As a side I had Ore Ida Crinkle Fries. For dessert later a Chocolate Dipped Frozen Banana. You can find the recipe for this in my previous post.